Ballymena United boss Glenn Ferguson was “delighted” with his side’s 5-0 Toals County Antrim Shield win over Glebe Rangers. “The objective in any cup competition is to get yourself into the next round and we’ve done that. 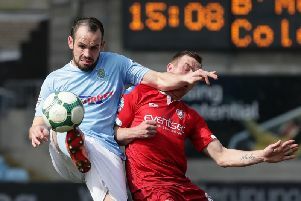 Ballymena United boss Glenn Ferguson was pleased with his side's County Antrim Shield win over Glebe Rangers. “If someone had said to me before the game that we would win 5-0, I would have certainly taken that,” added Ferguson.